My hair has finally grown long enough to try some Rita style waves. 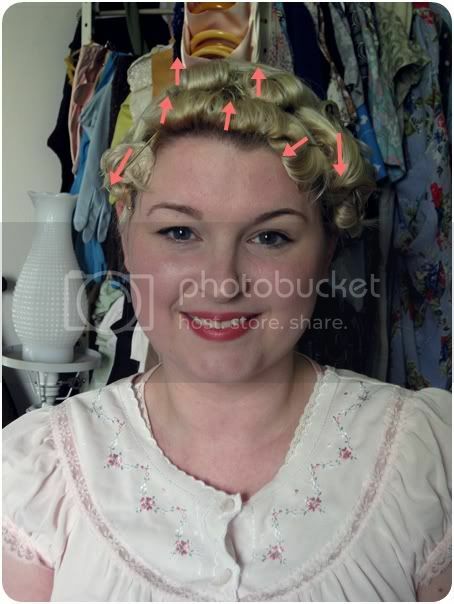 I used my Sculpture Pin Curler for this set but you can use manual pin curling as well. 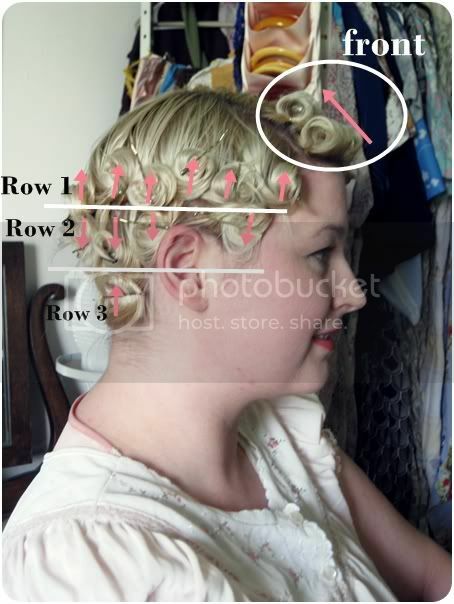 See yesterday's post about how to use the sculpture pin curler. This style works best on shoulder length or longer hair. My hair is cut in a femme fatale style, so it is layered and has that vintage "U" shape in the back. Begin by parting your hair way off to the side. I used the arch of my brow as a guide for the part. this little section off to the side is rolled down. Roll the rest of your hair in alternating layers. 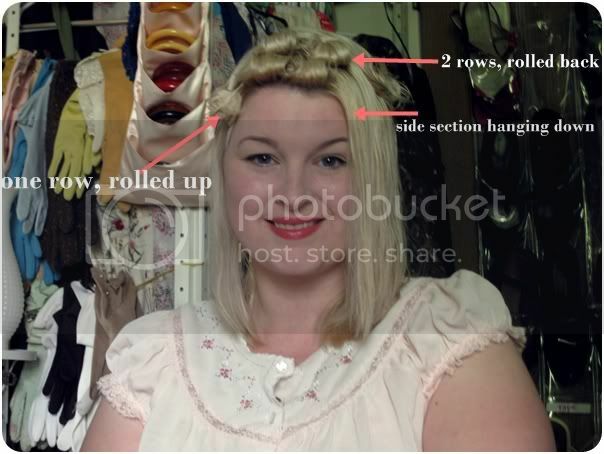 One layer rolled up, the next rolled down until all of your hair is pinned up. I did this around 5 in the evening, slept in it all night and took it out the next morning for a brush out. 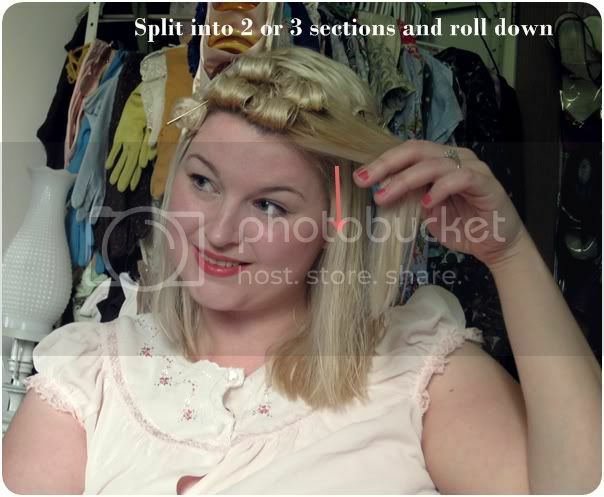 Brushing out a pin curl set is vital to the finished look. 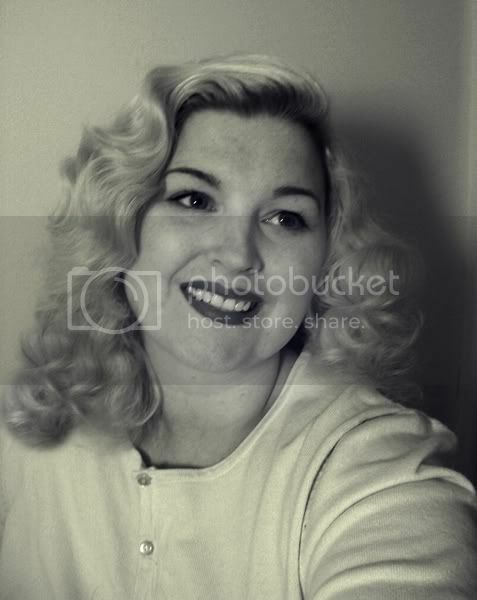 In the beginning of my pin curling days, I had no idea how to brush out a set so my hair looked very clown-like. This video is almost 15 minutes long but will show you exactly how I brush out this set. It really does take a long time to do but in the end, it looks fantastic. In the video, I share a few tips and tricks for how to de-frizz and how to sculpt your hair into waves. Please pardon my mid-western "just" and "kinda". It's funny how you never realize how you speak until you hear yourself, right? If you love Rita's style as much as I do, see her as a featured Friday Fashionista. 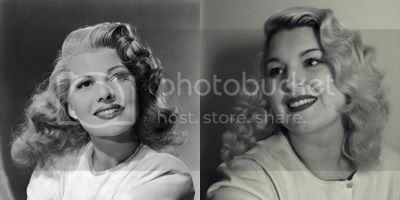 Va-Voom Vintage is not an affiliate of vintagehair.com. The Sculpture Pin Curler was provided in exchange for a review on this blog. All reviews and opinions presented on The Sculpture Pin Curler are my own. Looks fabulous! Thanks for sharing. :) And I have some of that blue floral fabric in my closet too! You did a terrific job - it looks so similar! I love tutorials - I saved it to my favorites. Thanks! Love it! 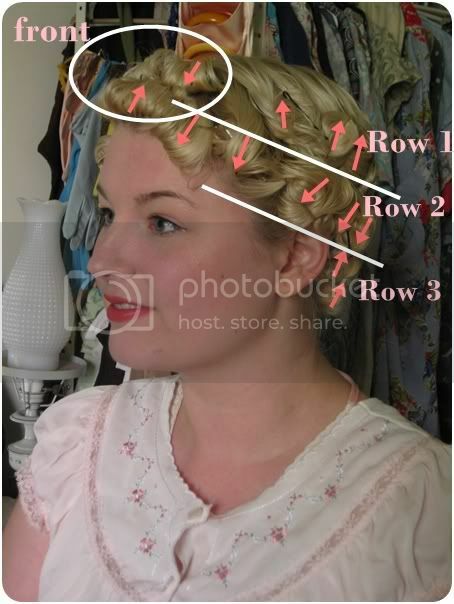 This was really helpful because whenever I pincurl I always get one side that looks much better than the other. Now I realise I need to curl them up or down! Can I ask what the Hair Insurance actually is? I'm curious as to what the English alternative would be. ps. Your accent is so cute! Oh, great question!! It's Aussie Hair Insurance, a leave-in conditioner and it comes in a regular spray bottle. I'm sure that any leave in conditioner would work fine if you're having problems with wild hair. Olivia is so cute! How I wish I didn't have Bettie Bangs every once in a while! So nice! Thanks so much for this! I've been trying like the devil to figure out how to do it on my own, but I'm sure this will help immensely. So awesome - it looks beautiful! I commented before I watched the video at the end. It great to see someone else brushing out - in real time! And that it is not just me who looses curl whilst brushing out! Fabulous! And it's such a striking style on you, to boot! I fear I got my hair cut a wee bit too short for my styling tastes, so once it grows back out a bit, I'm dying to give this a go. Thanks so much for the awesome tutorial! Wow! Amazing photos. The hair is almost identical. Thank You for taking the trubbel to post this. Work well done! Gosh you look soooo wonderful! What an incredibly handy, well done tutorial. Your hair turned out splendidly - so gorgeous and becoming. Brilliant!!! thanks for this! You look fabulous! I'm growing out my hair and contemplating curling more once it's long enough. I might have to try this. Thanks so much for sharing! And what a beautiful picture of you! Absolutely gorgeous! It suits you very much! This is a really fab tutorial! This is so beautiful and easy to follow. Thank you darling! I want to try this tonight! Thank you for posting! I loved Olivia showing up , haha you definitely worked it out! What do I use instead of a vented brush? curl comb? ( I mean a really large tooth comb). Thank you so much this is really helpful! Thanks! I did use that and a boor bristle brush.